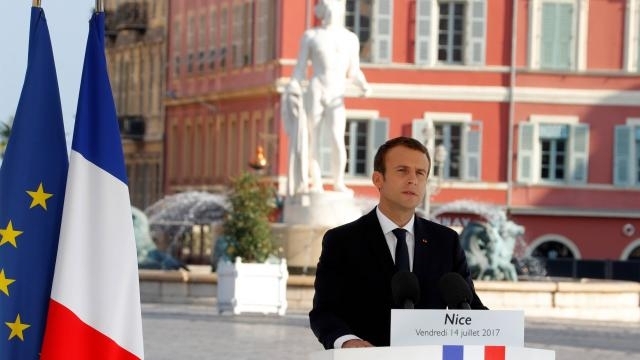 He was joined by former French presidents Nicolas Sarkozy and François Hollande to commemorate last year’s Bastille Day terror attack which killed 86 people when a truck ploughed into a crowd. In contrast with the grandiose celebrations in Paris, the Riviera resort banned firework displays and cancelled the firing of the cannon, a daily tradition in Nice. The Promenade des Anglais, the sight of the attack, was crowded with people paying homage to the victims, laying down plaques in red, white, and blue. 3000 white roses, which were donated by local florists, were handed out along the seafront as part of the remembrance ceremony. Security was tight during the sombre proceedings, with blockades stopping traffic near the site of the president’s speech. During the military ceremony, Mr Macron decorated members of the public, police, firefighters and hospital staff who helped to rescue last year’s victims. An inter-religious ceremony was held as part of the proceedings. Event concluded with a classical concert by the Nice Philharmonic Orchestra.